1 What’s A Headphone Amplifier, Anyway? 2 Why Might You Need One? 3 What specific sound improvements should I hear? 4 WHEN NOT TO USE AN AMP! 5 I Need An Amp — What Do I Buy? Actually, music devices such as smartphones, MP3 players and tablets have highly increased – maybe, to make our life easier and better. The modern audiophiles help you store thousands of songs in your pocket and enjoy them at any time of the day and at any place with a few swipes and taps of the touchscreen. 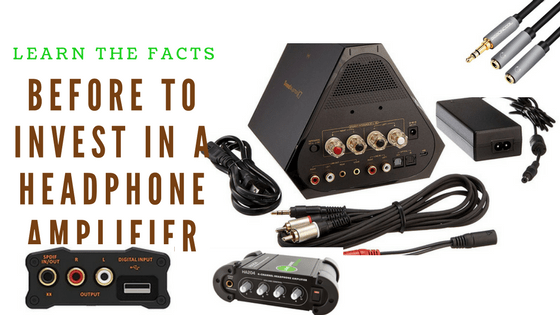 However, if you are serious about music quality, the audio quality from most mobile devices may disappoint you, particularly after pairing them with higher end headphones. To solve that, you will need to pair the mobile device with a highly portable headphone amplifier. The small devices are known to greatly improve the listening pleasure. What’s A Headphone Amplifier, Anyway? The term amp may not be new to you. However, you might have never learnt about its use. Only the audiophiles working with higher end audio setups worry about such details regularly. Amp is the short for amplifier. The name itself is a better description of what amps do. Amplifiers increase the power of any audio source so that they can drive bigger and louder equipment in a better way. Some home theaters use amplifiers – usually in their receiver – to power the big speakers. Bands also require amplifiers to power their many massive concert speakers. Now, headphone amps are simply smaller versions of the same concept. The smallest headphone amplifier in the market is hardly the size of solid state hard drive and the largest are almost the size of your CD-ROM drive. However, they all accomplish one goal. Connection between headphones and the amps that power concerts is not obvious. Most people believe that headphones are easier to power – and that is true compared to most other devices. However, MP3 players, smartphones and tablets are exceptionally small and have to manage power consumption carefully. In other words, mobile devices do not provide the power needed to drive higher end equipment. Headphones are basically set of speakers set up to fit on the user’s head and ears comfortably. Just like any other speaker in the market, they require power – in this situation, the power is provided by 3.5 millimeter audio jack. Whenever the audio jack fails to provide sufficient power to drive your headphones, they will remain strangely quiet and even miss some aspects such as strong bass. That mainly occurs because headphones unlike many other electronics do not switch off when power hits a certain point. They continue working, but not as efficient as they should. You can infer the power you require to drive your headphone by the impedance. Sets with higher impedance such as those rated at 300 ohms require more voltage to produce a set volume while those with lower impedance such as those rated at 25 ohms require less voltage. However, you do not require a headphone amp unless you are using a set rated more than 100 ohms. To buy a headphone amp, start by analyzing the sound. A headphone set that is not as loud as it should be might not be receiving the right amount of power. If you are uncertain, try your pair with your home theater receiver or any other powerful audio source in your home. Remember that headphone amps apply to on-ear headphones. Earbuds or in-ear headphones work differently and will need lesser power to function. What specific sound improvements should I hear? Just like a great room speaker improves when partnered with greater power amp, headphones are miniature speaker systems that can also highly benefit from headphone amps to sound their best. Adding a quality amp between your MP3 player and the audiophile headphones will provide significant audible improvements in detail, dynamics and clarity. Big speakers out-perform headphones when it comes to visceral sonic impact but quality headphones deliver superior audio resolution and allow access to nuanced lower level information beclouded in the recording. One of the commonest reactions people have after using high quality audiophile headphone amps is, “I heard something I have never heard before” or “I have to listen to my music collections over again”. There is a wider variety of headphone amps to consider. WHEN NOT TO USE AN AMP! Most earbuds or in-ear headphones are highly efficient and work well with portable devices like smartphones and tablets without the need of an amp. Also, an amp is not important when using noise cancelling headphones because they feature in-built headphone amp. That alone prevents headphone amps from adding significant audio benefits. I Need An Amp — What Do I Buy? You might not need to amplify a headphone when using it with a portable device such as an iPhone or a tablet. The amps are purposeful. Some years back, manufacturers would release headphones with higher impedance than the current ones. To ensure that the headphones they release perform reasonably well with your mobile hardware, they have adjusted the building. If you really need a Headphone Amplifier, consider something that is slim but powerful. Aim for amps that can offer more than 500 milliwatts of power and with lower output impedance – preferably several Ohms or less. An amp rated above 850mW and featuring an in-built battery will last for at least six hours and will power almost any headphone set available in the market. The headphone amp should also fit in your pocket. Alternatively, you can go with a smaller and lighter device. Some units rated at 300mW output may not drive your beefiest headphones but are suitable for mid-range audiophile gear. They will also cost you a lesser amount. You might have difficulties understanding headphone amp, but it is not necessary. If your headphones are loud enough to tolerate at the maximum volume, you do not need an Headphone Amplifier. However, if you have a higher impedance audiophile headphone set, you have to purchase one. The amp will improve the sound quality and help you access information easily.